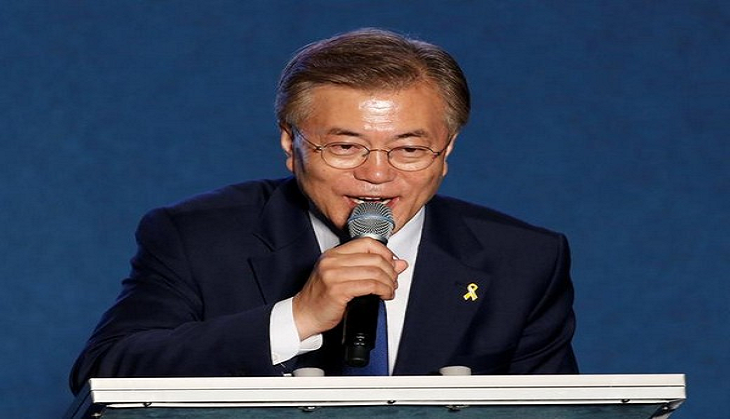 Former human rights lawyer Moon Jae-in was sworn in as South Korea's new President on Wednesday, hours after the country's election commission confirmed his victory in the polls. Moon said he would "solve the current security challenges" and was willing to visit Pyongyang under "the right conditions." Indicating an area of rapprochement with North Korea, Moon said, "I will do my best to bring peace on the Korean peninsula." Even North Korea indicated that Moon was its favoured candidate, with state media recently calling on South Korean voters to "punish the puppet group of conservatives' associated with Park . Moon, a son of North Korean refugees, faces the challenge of enacting changes to limit the power of big business and address the abuses uncovered in his predecessor's downfall, New York Times reported. Meanwhile, Trump administration has all the options on table to force North Korea to curb its nuclear and ballistic missiles program. The 64-year old left-leaning liberal positioned himself as the only candidate qualified to reunite the country after the bitter divisions that opened up over Park's abuse of power scandal. The decision to call for early presidential polls was caused by the March 10 ouster of former President Park Geun-hye by a Constitutional court. Meanwhile, the impeached former President remains jailed in a corruption case involving interventions to the presidency from her aide, as well as allegedly connected her to Samsung and the Lotte group.